Health warning: do not look at this painting too long if you suffer from sea-sickness. As you focus your eyes on the quilt of waves on the horizon, you stomach will eventually get dragged down into the wave trough in the lower left hand corner. Yes, the sea is beautiful, but it is not tame. The sea's power leaves us feeling small; it even dictates our horizons. 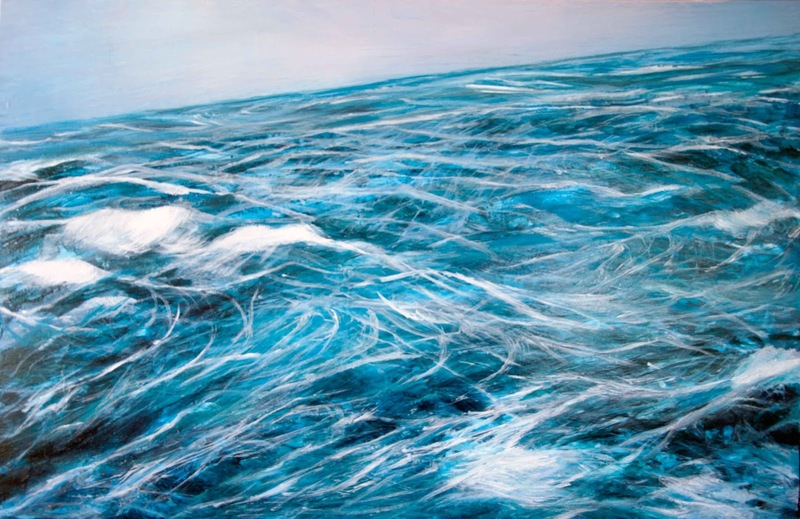 This painting calls to mind a ferry crossing to Orkney. Through the port-hole, the horizon would not keep still. Occasionally it disappeared from sight completely, replaced with a wall of water, as the ferry was swept into a trough. It was better to close my eyes. Later that day we dropped in at EMEC. Of course, they have real-time wave measurements. Apparently that was only a significant wave height of 2.5m. This painting is part of the exhibition 'Expanding the Horizon' by Mexican artist Pilar Cortes, currently on in Bristol (Hamilton House, 80 Stokes Croft Road) until the 24 August. If you like art that might reflect the sense of awe you would feel when standing on a frozen mountain top, the sublime mixture of terror and delight at seeing a volcano, or the contradictory peaceful oppressiveness of a fjord, see http://www.pilarcortes.co.uk/. I have often thought that the people at conferences who are casually talking about Hs=4m, or about 8 knot currents, would do well to visit somewhere like Orkney and see for themselves what those conditions are actually like.